A good case is made that in practice hardness is not a great consideration in choosing materials for use in jewelry. The text is sprinkled with littl e bits of experience and hard won information; which gem materials do this or that: descriptions of their nature. 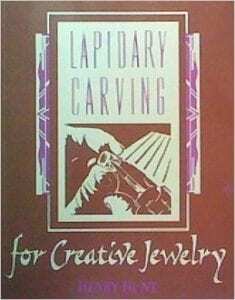 Carving materials are discussed in terms of ease of use and applicability. If you are interested in knowing how to carve gem materials with a minimum of fuss and specialized equipment this one is for you. It is loaded with cutter’s tricks and cheap ways to make effective tools including ones own silicon carbide cutting tools. I’ve never seen a book before that goes through the home version of industrial firing procedures necessary to make professional gem carving tools. Henry Hunt is obviously a master cutter, someone who understands his material and how to work it. Despite an initial dry feel and rough quality photographs this is an excellent book for someone who wants to know about this field whether a collector, goldsmith or lapidary.If we were rating it like a movie show on T.V. out of 8 stars this would be a six and a half having lost one star due to the photos. The cover of this book has a strong, a little naive graphic look to it with a ‘southwest feel’. There is a very good safety warning page at the front of the book with an ‘additional safety disclaimer’ in a grey box. It is a truly sad commentary that as an author one is really concerned about being sued for wrongfully applied information. Unlike other fields like medicine or science in jewelry greed sometimes seems to be uppermost and authors have in the past been successfully sued by readers who misused the information given. It irritates me that some of us ‘mess our own nest’ as metalsmiths and stop the information flow by suing people for their publications. The book is published by GeoScience Press which publishes among other books John Sinkakas’s extraordinary volume ‘Gemstone and Mineral Data Book‘ which should be in every serious metalsmiths library.